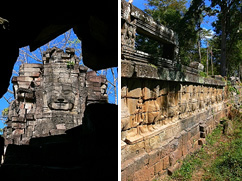 Visit one of the five major monuments of Angkor. Large ruins are to be located as well within 5 km of the site. 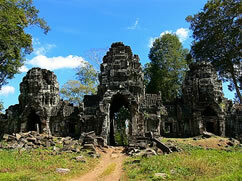 The ruins of Preah Domrei and Preah Stung can be visited there as well. •	Minimum 2 pax per tour / group. If you wish to go on a private charter (one guest and guide only) and as per our tour policy, we will charge you on a 2 pax basis. •	Tour guide and transportation included. •	During the HIGH SEASON (usually from October until March), it is recommended to book your tours and plan your itinerary as soon as possible. •	Should you wish to cancel your hotel reservation less than two weeks before supposed arrival, cancellation charges will apply (depending on hotel policies).
. Should you wish to cancel any of your booked tour itineraries less than one day before the departure, a cancellation fee will be charged as well. •	In accordance with our policy, all children aged 2 years and below are free of charge, all children aged between 3 and 12 yrs will be charged with 50% off the tariff rates and all children aged 13 and above shall be considered an adult and be charged with a full rate. Please also note that our transportation units do not contain any child seat. •	Kindly manage all valuables and personal belongings by yourself. We constantly remind our guests not to bring any valuable or expensive items while on tour however, if you wish to do so then they will be at your own risk. SKETCH TRAVEL will not assume any responsibility on any damaged, lost or stolen property. •	Kindly note that all time schedules are always approximated. Certain time adjustments may occur due to traffic, weather conditions and other unavoidable circumstances that may lead to delay or cancellation of the tour itself. If the tour is cancelled based on the events that is beyond our control, no refund shall be awarded. •	Kindly note that all tour itineraries, schedules and programs are subject to a cancellation fee.